Can the Catholic Church Save Congo? 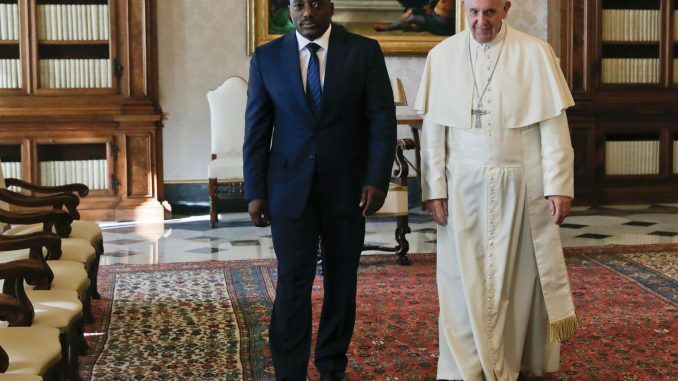 When Pope Francis received Congolese president Joseph Kabila at the Vatican on September 26, the meeting did not take place in the reception room where the pontiff usually meets visiting heads of state. Instead, the pope greeted Kabila in his library before holding a brief 20-minute meeting conducted through interpreters, in which he raised concerns about the killing of scores of protesters in Congo’s capital, Kinshasa, who were demonstrating against expected delays to elections originally slated for November. Francis, unsurprisingly, did not indicate that the breach of protocol was intentional. But according to DRC expert Phil Clark, the choice of venue echoed the Catholic Church’s position in opposing Kabila’s apparent attempts to delay elections and stay in power beyond his term in Congo, one of Africa’s most promising yet fragile countries. According to observers, Congo is on the brink of falling back into conflict. There have been signs of political unrest since January 2015, when scores of protesters were killed in Kinshasa clashes with security forces. The protests were called after a bill was put forward that would allow Kabila to remain in power while a national census was conducted, thereby potentially delaying presidential and parliamentary elections and keeping Kabila in power. The fears of the protesters who took to the streets of the capital were not misplaced. After months of protests against the possible delays—including a mass demonstration in Kinshasa on September 20, in which around 50 people were killed in clashes with security forces, according to opposition groups, and which the government called an uprising—the Congolese electoral commission announced in October that the proposed vote would likely be delayed by up to two years. Kabila explained that this was in order to stop millions of unregistered voters being “locked out” of the election, but opposition groups have interpreted it as evidence of glissement —a French term meaning “slippage” that has been used by anti-Kabila protesters to describe what they see as attempts to stay in power. After the killings, the Church temporarily suspended its role and then, in early October, it completely pulled out. “Only an inclusive dialogue which respects the constitutional order will provide a framework for resolving our crisis,” said Archbishop Utembi Tapa, the president of the Congolese bishops’ conference, upon announcing the withdrawal. The Church has since, at Kabila’s request, opened talks with opposition groups not included in the national dialogue, but the consultations has not yet borne any concrete resolutions. The church’s withdrawal from the national dialogue has damaged the credibility of the entire process, says Ben Shepherd, associate fellow at London-based think tank Chatham House. Around half of the country’s 80 million-plus population are Roman Catholic and the church has a vast infrastructure of schools, hospitals and even private businesses across the country. “The Catholic Church is one of the few institutions in Congo with genuine popular trust and links to the population at all levels,” says Shepherd. Following the announced delay to elections, the situation in Congo remains tense and confusing. Opposition political parties—the most prominent of which have coalesced around a shared platform known as Rassemblement (“Rally”)—are continuing to call for protests, while Kabila has begun reforming his government to include opposition figures who participated in the national dialogue. The church has positioned itself as a defender of the people in Congo, and the people appear to be turning against Kabila: a recent survey of 7,500 Congolese found that three in four respondents thought the president should leave power by the end of 2016, and four in five rejected any potential constitutional change that could keep Kabila in power.